Shannon Griffith, Joe Benzer, Alanta Noel, and Derek Lookingbill at the DreamStalker Films booth. First of all, I have to say a HUGE Thanks to everyone for their support of our fledgling company this last weekend at the Phoenix Comicon! Especially to Shannon and Alanta for coming out and working the booth with us (and alone when Derek and I were at the screening or getting our geek on with Stan Lee) for the entire Con. Thanks also need to be said to Jason, Dori, and Everett for hanging out on the last day and making it so all the tons of stuff we had left we could get back to the truck in one trip. So here’s the rundown… Friday was our first day at the table. The day was a bit slow as far as selling product, but we made some film connections and spread the word about DreamStalker Films. Shortly after we had opened the DSF Booth, our short film, “The Family That Decays Together…” premiered at the Film Festival during the local films block. Derek and I were there to hear the audience reaction. We heard laughs and “ahhh”s in all the right places, so seems to have gone over well. Saturday was a much busier day at the whole Con, and our booth was no exception. We sold more DreamStalker Films Shorts Vol. I DVDs this day than any other at the Con. Thanks to Matt showing up we were also finally able to sell our first Car Decal. Sunday, was pretty busy still at the Con, most likely due to Stan “The Man” Lee being on hand for autographs and pictures that day. We sold some more DVDs, despite not being able to offer any more free Slayer Wars DVDs along with them as our supply had run out. Also, thanks to some supportive family members and Jason coming down we were able to sell some more decals as well as several T-Shirts. Additionally, we had some added products this day thanks to Dori Perry: DSF Dice Bags! We were able to sell one of these nifty products, too! 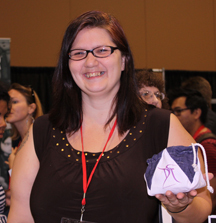 Dori with one of the DSF Dice Bags she created. On Sunday, Derek and I had the honor of getting our picture taken with Stan Lee. 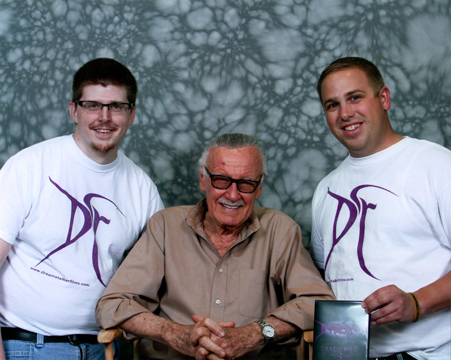 Check out us sporting our DSF shirts with “The Man” and a copy of our DVD we gave him. Overall, we sold 35 DreamStalker Films Shorts Vol I DVDs, 3 T-Shirts, 4 Decals, and 1 Dice Bag. Not too shabby for a pretty much unknown independent film company. More importantly, we spread the word and made a bunch of new contacts for potential fans, filmmakers, and actors. For everyone that were not able to make it out to the Con or didn’t have any money at the time, there are plenty of DreamStalker Films products left. Looking to the future, we will have these items available by PayPal on this site, but for now, if you’re interested in a DVD, T-Shirt, Decal, or Dice Bag, contact us at dreamstalkerfilms@gmail.com. If you’re a veteran DreamStalker Films cast/crew member, ask about our discount especially for you! Stay tuned for the next post with an update on Slayer Wars 3.